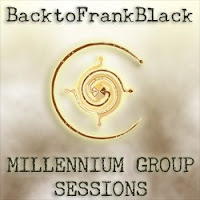 BACKTOFRANKBLACK.COM: BacktoFrankBlack: Millennium Group Sessions - PODCAST now online! BacktoFrankBlack: Millennium Group Sessions - PODCAST now online! This free podcast is available on a fortnightly basis via ITUNES. We'll naturally update you all on information on the podcast from this blog as well. In related news, Troy and Jim have just finished recording a podcast with Spooktalkular that will be released later this week. Great little session with Spooktalkular hosts Frank and Laura. Watch for further updates! 4 Responses to "BacktoFrankBlack: Millennium Group Sessions - PODCAST now online!" Enjoyed the podcast. Can't wait for the next installment. Downloading the standard version now! Incredible podcast guys, a really superb addition to the campaign. I cannot wait for episode two of this. Here's hoping everyone who has been following your efforts downloads it too. BRING BACK FRANK BLACK!